Well, another New Year crept up on us once again and once again I will commit to listing on the website! This all started way back in 2012 and several of us continued on in 2013, 2014 and 2015. Just looking at everyone’s lists over the years you can see how varied our birding lives can be. My lists have only covered one continent, Australia, so the numbers have remained quite similar from year to year. However, it is interesting that some bird species can be seen in January one year and for various reasons may not be observed until much later in the year on other years. What we observe on January 1st in any year is usually tide dependent as far as shorebirds go and any birds that may be observed at the ephemeral lakes is highly variable. Some years we can’t get to the ephemeral lakes in January due to the flooding rains and track closures, but this year the lakes are very close to be entirely dry. We started our birding year at home in the garden and then headed for the last remaining water in the ephemeral lakes and returned to town across the open plains to visit the shores of Roebuck Bay to add the majority of our local shorebirds to the 2016 Year List. Our day ended with a total of 122, but the day was a birding surprise day. Many birds we would not have expected to necessarily make it onto the list so early in the year were present even if only singularly and other common birds chose not to be observed on the first day of the year. That’s the best thing about birding….you just never know what you may observe on any day in any location! An unexpected trip to the UK on September 28th after 22 years of absence saw us add some new birds to the year list, which I will tag on the bottom and start the first bird in blue writing! 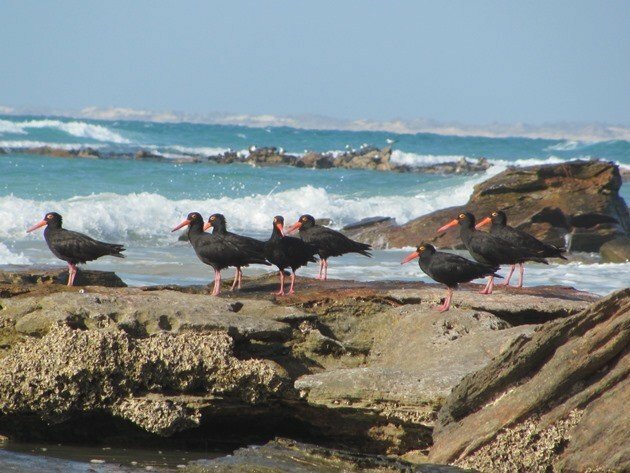 The above photo shows some of the seventeen Sooty Oystercatchers that are enjoying Gantheaume Point reef in January. This list was last updated November 13th 2016. 122 species in one day- pretty nice way to start the year! Yes! There is plenty of variety around Broome in January! That’s amazing, Clare! I thought I was doing well with 36 species so far this year! Good Luck for the rest of 2016!